Totternhoe continued their freescoring form with a 6-1 demolition of Berkhamsted Raiders on Saturday to make it five wins in a row, scoring an incredible 26 goals in that time. 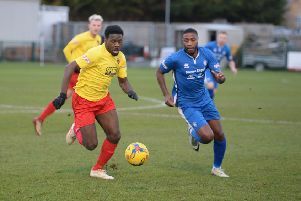 It had been Raiders who started the better, but couldn’t create any clear-cut chances as the hosts went ahead against the run of play on 25 minutes, Joe Smith latching on to Joel McCormick’s through ball to beat the keeper and tap home. Totts then went on to dominate, moving 2-0 up in the 36th minute when Andy Cleere finished well on the half volley after more good work from McCormick. The Totts were much improved in the second period and the killer goal came 10 minutes in, Mitch Brent powering home a spot kick after a handball in the area. Aidan Murray made it 4-0 on the hour mark, scoring from Olly Hibbitt’s pass, while Cleere then grabbed his second, firing home on 71 minutes. Berkhamsted did grab a consolation with 11 minutes to go after a good finish from the edge of the box, but the Totts hit straight back when a teasing Murray cross was converted by McCormick. Boss Chris Robson said: “I felt we started the game very poorly, probably as bad as we have been this season. “It was down to a lack of application and being complacent. “We came into the game after a two week break and on a high after our recent performances, also with a cup final coming up next week it is a distraction. “We seemed to have the attitude that all we had to do is turn up against one of the struggling sides in our league, but football doesn’t work like that. “You need to earn the right and we didn’t, Berkhampsted were by far the better side in the first half in my opinion. “Some remiders were giving at half time in a heated way, and the players responded with a good second half performance. “We are on a great run and scoring goals. Credit to the players as they are being ruthless and really putting teams to the sword at the moment. Totts visit Loughton Manor on Saturday and then face Cranfield United in the Beds County Cup final at Bedford Town FC on Wednesday, March 7, kick-off 7.30pm. Totts: Bowley, O’Conner (Murchie), Lauder, Hibbitt, Folland, Bishop, Rimmer (Farmer), Murray, McCormick, Cleere, Smith (Brent). Subs not used: Golding, Irons.